Frome Memorial Theatre supporters are celebrating after the last of its old seats were replaced following a six-year £88,000 campaign to upgrade the auditorium’s seating. Thanks to generous donations from theatre patrons and local businesses and organisations, Frome Memorial Theatre has now successfully replaced all 534 of the seats, completing the project which was started back in 2010. Chairman of trustees Humphrey Barnes said, “During early January great joy surrounded the Frome Memorial Theatre as the final 72 new seats were installed. “Our theatre patrons have been very generous with their donations over the years, donating £100 towards the cost of a seat. I would also like to acknowledge donations from local businesses and organisations in the town. “There was a shortfall of approximately £13,000 to complete the project which has been financed by ourselves from Memorial Theatre funds; the total cost of the reseating was £88,000. 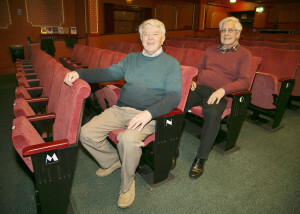 “We must thank our maintenance team at the theatre for removing and selling the old seats, and fitting the new, as this saved us many hundreds of pounds. The trustees now turn their attention to organising fundraising events in aid of the theatre’s boiler appeal. Between £30,000 – £40,000 is needed to replace two of the theatre’s four boilers for heating which stopped working last year. The first fundraising event will be a quiz night, held at the Assembly Rooms on Saturday 27th February. Humphrey Barnes said, “We announced in November that we have a major problem with our heating system for the theatre and the Assembly Rooms, the winter (so far) has been kind to us, the mildest winter for some time. “Two of our four boilers are working fine, and the heating throughout the complex has not been affected, however the trustees feel we must address the problem shortly.